Coldplay have always wanted it both ways. Since they arrived on the scene back in the early, early 2000s, they’ve (somewhat awkwardly) balanced two aspirations: being mega-pop titans and the next great art-rock band. On 2008’s Viva La Vida, their finest album to date, these four good-natured Englishmen were both of those things simultaneously—filling stadiums, dominating radio, and still managing to push their music forward into unexpected places. Equally important, not a single note felt forced or out-of-place. Mylo Xyloto, their fifth studio album, clearly has those same dual ambitions, and in fact, they’ve aimed even higher in both directions—attempting to out-art themselves with a concept album about…I don’t know…some kind of “revolution,” and nudging their sound toward mainstream R&B and all its neon-glow synths, sub-bass, and programmed beats. Sounds reasonably intriguing on paper, but the formula turns out to be a bit wonky. First (obvious) things first: Chris Martin ain’t exactly Bill Shakespeare when it comes to words. And no, that’s never why anybody has ever listened to Coldplay in the first place, but at their finest (singles like “Viva La Vida” and “The Scientist,” album tracks like “Strawberry Swing”), Martin’s doe-eyed emotion was earnest enough to more than counter any cliché. Mylo Xyloto’s flimsy concept (two lovers pulled apart by an oppressive modern doom-scape) isn’t doing them any favors, but the results are an especially milky shade of bland; the opening parade in the synth-drenched arena-rave single “Every Teardrop is a Waterfall” is an adjective or two removed from Rebecca Black’s “Friday,” and less funny, too (“I turn my music up; I got my records on (…) / I feel my heart start beatin’ to my favorite song”). What other band on the freaking planet would dare collaborate with Rihanna and Brian Eno on the same album? 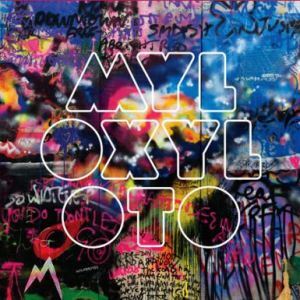 Much to Coldplay’s credit, those two blindingly removed poles are neatly coalesced on Mylo Xyloto (Rihanna’s duet on the beat-heavy “Princess of China” works way better than it should), even if Eno’s magic “Enoxification” feels more transparent than with Viva’s swirling, worldly colors. Long-rumored to be the band’s “acoustic album,” Mylo is certainly not an intimate affair, but tucked between the synth bangers and arena-ready epics (like the wonderful “Charlie Brown”) are a few quiet gems that make an “acoustic project” seem like an idea worth pursuing next go-round. “Us Against the World” is gorgeous and jarringly fragile—Martin’s raw, vocal scraping the bottom of his range, backed largely by nothing more than a folky strum. It’s a moment of stirring calm amid a sea of blaring showiness, and this well-intended mixed bag, despite its lovely surfaces, could have used more of that variety.